A pine tree native to the slops of Bulgaria, Albania, North Greece and Macedonia (you should expect to find it here realistically with a name like that!) however it will still grow fine in the UK as it has been growing here since 1864. 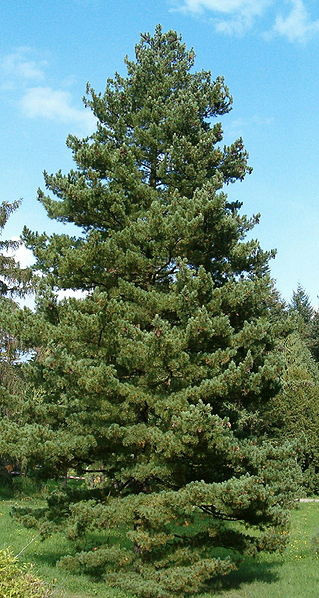 Not a lofty giant of a pine tree so expect a final height of around 40m and possibly 1.5m girth although 60cm is more common. Should give you a conical or columnar shape that is around 8m wide. Expect slow initial growth accelerating to 30-60cm per year and should reach 150 years old on average. Plant in full sun or partial shade in loam to sand to highly acidic to slightly alkaline. Considered a stable tree because of the root system that develops deeply into the soil. A popular ornamental tree in parks as it gives reliable growth under a wide range of conditions which it certainly receives in the UK. Being able to withstand temperatures of around minus 30 degree centigrade we are confident saying that it will withstand our UK Winters and also wind exposure tolerant. One of the other reasons for being suitable for park planting is that it is resistant to general air pollution. Can be planted at altitudes around 2400m without major issue and will tolerate poor soils. 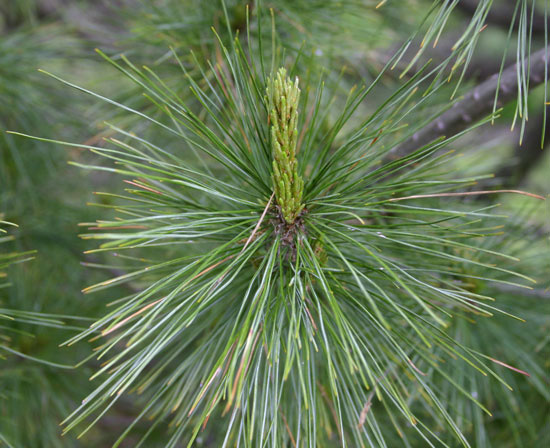 With climate change upon us, Macedonian Pine is an important consideration due to its adaptability especially if other Pine trees suffer as a result. As it adapts very well to severe mountain climates, it is an excellent tree from protection against erosion. In fact it is such a tough nut that it resists attack from disease, fungus and insects very well. This is because of its high resin content which is considered toxic. 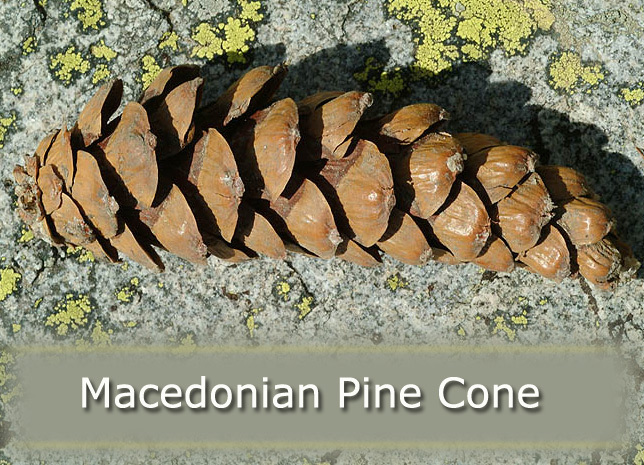 Macedonian pine trees found over 1800m generally become multi-trunk. The pine cones are between 8-16cm long roughly. We say that just in case there are any trading standards people out there with a very accurate tape measure and little understanding of Mother Nature. They start long and green becoming yellow-brown when mature. They take 2 years to mature and are ready around September-October time. Expect the needles to be bunched in fives up to 11cm long and a deep blue-green colour. 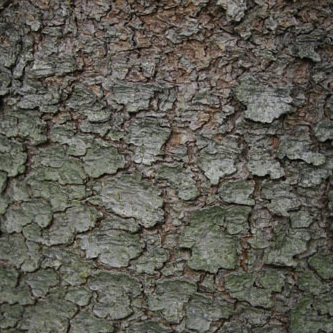 Bark on young trees is a smooth silvery grey green with fine red fissures and as it ages this darkens becoming purple with large smooth areas between the fissures. Up to around 50 years old the bark is smooth and a dark green or violet colour. Very resistant to white pine blister rust, Cronartium ribicola. Macedonian Pine wood light, soft and durable and used for construction, cooperage, furniture production and carving.